Create essential access to underground drainage systems with household inspection chambers from Marshalls. Featuring tongue and groove detailing to aid accurate on-site placement, our robust concrete house inspection chambers offer outstanding durability and sulphate resistance. To aid flexibility, our collection is made up of a range of pre-formed modular concrete components, which, once selected, are stacked to create ideal-sized house inspection chambers. Each component is available in a choice of 4 sizes and 2 depths so you can find the right one for your project. They’re also designed to easily fit drainage fittings and fixtures, reducing the need for any additional work to the system. 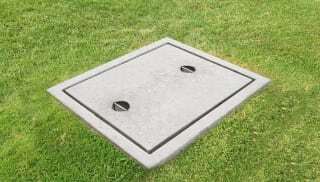 A variety of removable concrete covers, fitted frames and reducer slabs are available to help ensure the best fit and most cost-effective solution. We can advise on the best use of each component where suitable. Browse our household inspection chambers now.